UPDATE (25 Jan 2010): There is now a SAPLink Nugget containing the class at the end of this post. 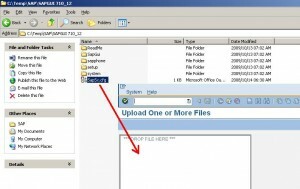 You know how you normally write those programs for users to upload files from their desktop? You normally put a field on the selection screen, and if you are kind enough, provide a dropdown that opens the Windows Explorer File Open dialog. 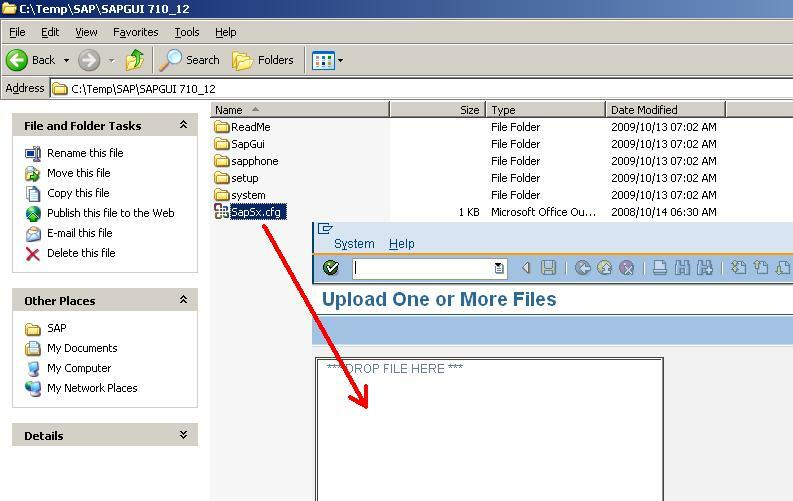 Using this nice and easy technique, however, you can let users drag files from Explorer on to the SAP GUI and upload the files that way instead. The first thing we will do is to create a new class, so head over to SE24 already. I originally intended to inherit from CL_GUI_TEXTEDIT, but I decided instead to have an attribute of this type, together with a CL_GUI_CUSTOM_CONTAINER. The program developer (you) will only have to instantiate the class with the name of the control on the screen (and a callback routine name, but we’ll get to that further on). The reason I used CL_GUI_TEXTEDIT is that it implements file-drop behaviour, and we can customize it to look like a fairly decent drop target with minimal effort. Next, we will declare the methods. There is only a Constructor, and an event handler for the text edit control for when a file is dropped on it. The DROP_HANDLER method has no parameters (like the event for which it caters). 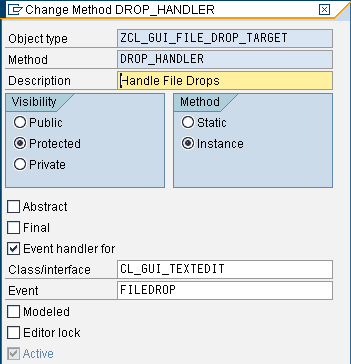 To set it as an event handler, open up the properties for the method and set it as an event handler for event FILEDROP of class CL_GUI_TEXTEDIT. The constructor takes as its parameters the name of the container on the dynpro screen, and optionally (although it would be senseless without it) the name of the callback subroutine in your program that will receive the names of the files dropped on the editor control. msg_len = strlen( drop_message ). 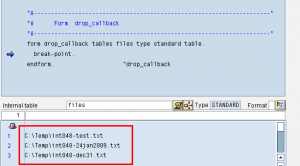 read table lt_call into ls_call index 2.
editor->protect_lines( from_line = 1 to_line = 200 ). set handler drop_handler for editor. Our first course of action is to instantiate the necessary controls for the screen, namely the container and the text edit control. We enable the text edit control to respond to file drop events (we are catering for the possibility that the user may want to upload multiple files). The maximum number of characters is determined from the drop_message variable. You will probably want to make this text language-dependent. To save the developer from having to specify the name of the program from which they are invoking this class, we interrogate the call stack to get the program name, just as a courtesy to them. Now we disable the toolbar and status bar, because they would serve no purpose other than looking ugly. We set the text to our message, telling the user that this is a drop target for their file(s). Also, we protect the text, thereby preventing the user from entering or changing text. If we completely disabled the text editor, the drop event would not be handled. Lastly, we register the multiple file drop event so that the control actually handles it. The very last line sets our DROP_HANDLER method as the handler for the event. data: paths like table of path. editor->get_path_of_dropped_files( importing table = paths ). This method calls the GET_PATH_OF_DROPPED_FILES on the text edit control to obtain the names of the dropped files. It then passed it back to the calling program via the callback routine specified in the constructor. Well, that was easy! Now, let’s look at a program that makes use of this class. The first thing to do is define a screen with an area on it that will hold the drop target control. You can simply add this to a report program if you wish. (That’s what I did). 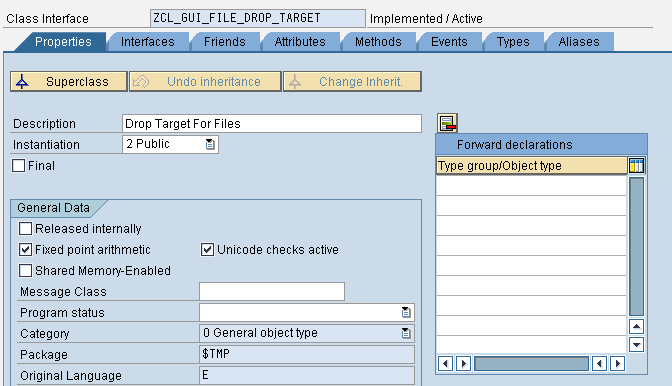 data: drop_target type ref to zcl_gui_file_drop_target. 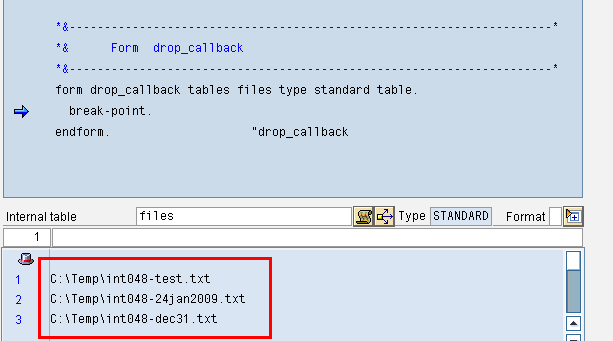 form drop_callback tables files type standard table. In the PBO module, we simply instantiate the class once, passing it the name of the container on our screen, and the name of the callback subroutine. The PAI module simply has a method for getting out of the screen for demo purposes. 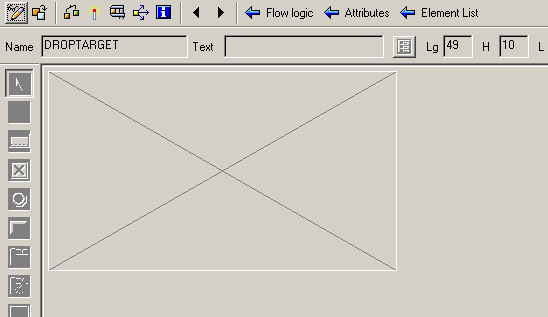 This entry was posted on Friday, January 22nd, 2010 at 3:08 pm and is filed under ABAP, Ideas/Insights, SAP. You can follow any responses to this entry through the RSS 2.0 feed. You can leave a response, or trackback from your own site.